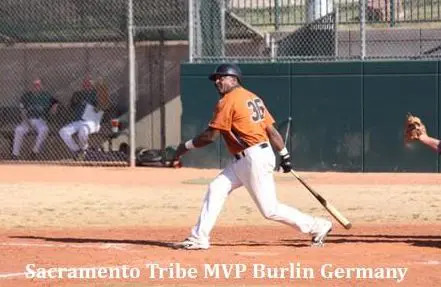 The Sacramento Tribe flexed their Las Vegas championship muscle yet again to capture the 55+ Wood Bat title in the 2013 edition of the MSBL Kickoff Classic. The Tribe defeated the Washington state based Las Vegas Mariners 18-11 in the title game behind a 3 for 4 day at the plate from left fielder Mike Thatcher. The game started innocently enough with the teams deadlocked at four runs apiece through three innings. The Tribe scored two apiece in the first and second innings while the Mariners strung together four in the second inning on a couple of hits and a couple of Tribe errors. The third was scoreless for both teams but then, unfortunately for the Mariners, the bottom of the fourth inning showed up and so did the Tribe. The Tribe put together a half dozen hits, a walk and a Mariner wild pitch in the fateful fourth, and before you knew it there was an eight spot on the board and the Mariners were looking at a serious uphill climb against the defending champs. The Mariners also had to endure a little early-season wildness as their staff issued eleven bases on balls to help the Tribe. Sacramento has been in the title game every year since 2004 and won the whole enchilada in 2006, 2007, 2008, 2009, 2011, 2012 and now in 2013. “Base running played a big part in the fourth inning,” explained Chavez. “We had a player strike out with the bases loaded but the ball got away from the catcher.Our guy on second just kept running and also scored. That really hurt them. We like to think we have some pretty good team speed up and down the line-up. That can be a real difference maker when you are playing in an over fifty division.”Sacramento added three in both the fifth and sixth innings but to the credit of the Mariners they put together a ‘never say die’ seven run sixth inning themselves behind a seven hit barrage to close the gap to 18-11. Neither team scored from there on but the damage was done and the Tribe once again found themselves collecting the hardware. Pitcher Carlos Bryson went 6 2/3 innings for the win but had to leave with a pulled rib cage muscle. Gary Kleinfeldt came in and finished things up for the Tribe. The two teams knew each other, as Sacramento previously defeated the Mariners in the first game of the tournament as Gary Stonebrook threw a complete game shutout in an 11-0 victory.Ironman catcher Steve Welch caught every inning of every game for the Tribe while perennial MVP Burlin Germany added this year’s MVP award to his collection.